Mass movements (also called mass-wasting) is the down-slope movement of Regolith (loose uncemented mixture of soil and rock particles that covers the Earth's surface) by the force of gravity without the aid of a transporting medium such as water, ice, or wind. Still, as we shall see, water plays a key role. Mass movements are part of a continuum of erosional processes between weathering and stream transport. Mass movement causes regolith and rock to move down-slope where sooner or later the loose particles will be picked up by another transporting agent and eventually moved to a site of deposition such as an ocean basin or lake bed. Mass movement processes are occurring continuously on all slopes; some act very slowly, others occur very suddenly, often with disastrous results. What determines whether or not a slope is stable or unstable? How are the different mass movement processes classified? How are mass movement events triggered? What observations might suggest that the area is unstable and may start to move? How can we mitigate against mass movement hazards? We start with a discussion of the forces acting at the surface that cause mass movements. Gravity is the main force responsible for mass movements. Gravity is a force that acts everywhere on the Earth's surface, pulling everything in a direction toward the center of the Earth. On a flat surface, parallel to the Earth's surface, the force of gravity acts downward. So long as the material remains on the flat surface it will not move under the force of gravity. Of course if the material forming the flat surface becomes weak or fails, then the unsupported support mass will move downward. On a slope, the force of gravity can be resolved into two components: a component acting perpendicular to the slope, and a component acting parallel to the slope. The perpendicular component of gravity, gp, helps to hold the object in place on the slope. The component of gravity acting parallel to the slope, gs, causes a shear stress parallel to the slope and helps to move the object in the down-slope direction. On a steeper slope, the shear stress component of gravity, gs, increases, and the perpendicular component of gravity, gp, decreases. Another force resisting movement down the slope is grouped under the term shear strength and includes frictional resistance and cohesion among the particles that make up the object. Thus, down-slope movement is favored by steeper slope angles (increasing the shear stress) and anything that reduces the shear strength (such as lowering the cohesion among the particles or lowering the frictional resistance. For unconsolidated material, the angle that forms a stable slope is called the angle of repose. Although water is not always directly involved as the transporting medium in mass movement processes, it does play an important role. Addition of water from rainfall or snow melt adds weight to the slope. Water can seep into the soil or rock and replace the air in the pore space or fractures. Since water is heavier than air, this increases the weight of the soil. If the material becomes saturated with water, vibrations could cause liquifaction to occur, just like often happens during earthquakes. Water can reduce the friction along a sliding surface. Water has the ability to change the angle of repose (the slope angle which is the stable angle for the slope). Think about building a sand castle on the beach. If the sand is totally dry, it is impossible to build a pile of sand with a steep face like a castle wall. If the sand is somewhat wet, however, one can build a vertical wall. If the sand is too wet, then it flows like a fluid and cannot remain in position as a wall. Dry unconsolidated grains will form a pile with a slope angle determined by the angle of repose. The angle of repose is the steepest angle at which a pile of unconsolidated grains remains stable, and is controlled by the frictional contact between the grains. In general, for dry materials the angle of repose increases with increasing grain size, but usually lies between about 30 and 45 o. Coarser grained and angular particles have a steeper angle of repose than fine grained and rounded particles. Slightly wet unconsolidated materials exhibit a very high angle of repose because surface tension between the water and the grains tends to hold the grains in place. When the material becomes saturated with water, the angle of repose is reduced to very small values and the material tends to flow like a fluid. This is because the water gets between the grains and eliminates grain to grain frictional contact. Expansive and Hydrocompacting Soils - These are soils that contain a high proportion of a type of clay mineral called smectites or montmorillinites. Such clay minerals expand when they become wet as water enters the crystal structure and increases the volume of the mineral. When such clays dry out, the loss of water causes the volume to decrease and the clays to shrink or compact (This process is referred to as hydrocompaction). Another material that shows similar swelling and compaction as a result of addition or removal of water is peat. Peat is organic-rich material accumulated in the bottoms of swamps as decaying vegetable matter. Sensitive Soils - In some soils the clay minerals are arranged in random fashion, with much pore space between the individual grains. This is often referred to as a "house of cards" structure. Often the grains are held in this position by salts (such as gypsum, calcite, or halite) precipitated in the pore space that "glue" the particles together.As water infiltrates into the pore spaces, as discussed above, it can both be absorbed onto the clay minerals, and can dissolve away the salts holding the "house of cards" together. Compaction of the soil or shaking of the soil can thus cause a rapid change in the structure of the material. The clay minerals will then line up with one another and the open space will be reduced. But this may cause a loss in shear strength of the soil and result in slippage down slope or liquefaction. Some water saturated clays are stable so long as they aren’t disturbed, but when shaking occurs, just like sands, they can turn into a runny fluid. These are referred to as quick clays. Rocks often contain planar structures that become slippage surfaces if weight is added or support is removed. Bedding Planes - These are basically planar layers of rocks upon which original deposition occurred. Since they are planar and since they may have a dip down-slope, they can form surfaces upon which sliding occurs, particularly if water can enter along the bedding plane to reduce cohesion. In the diagram below, note how the slope above the road on the left is inherently less stable than the slope above the road on the right. Weak Layers - Some rocks are stronger than others. In particular, clay minerals generally tend to have a low shear strength. If a weak rock or soil occurs between stronger rocks or soils, the weak layer will be the most likely place for failure to occur, especially if the layer dips in a down-slope direction as in the illustration above. Similarly, loose unconsolidated sand has no cohesive strength. A layer of such sand then becomes a weak layer in the slope. Joints & Fractures - If the joints are parallel to the slope they may become a sliding surface. Combined with joints running perpendicular to the slope (as seen in the sandstone body in the illustration above), the joint pattern results in fractures along which blocks can become loosened to slide down-slope. Foliation Planes - Foliation in metamorphic rocks is mainly caused by the alignment of sheet silicate minerals. 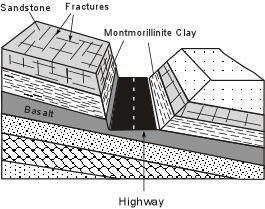 Because the sheet silicates can break easily parallel to their sheet structure, the foliation or schistosity may become a slip surface, particularly if it it dips in the down-slope direction. The down-slope movement of material, whether it be bedrock, regolith, or a mixture of these, is commonly referred to as a landslide. All of these processes generally grade into one another, so classification of mass movement processes is somewhat difficult. We will use a common classification of mass movements, which divides the processes into two broad categories and further subdivides these categories. Sediment Flows - material flows down hill mixed with water or air. Slumps - types of slides wherein downward rotation of rock or regolith occurs along a curved surface. The upper surface of each slump block remains relatively undisturbed, as do the individual blocks. Slumps leave arcuate scars or depressions on the hill slope. Heavy rains or earthquakes usually trigger slumps. Rock Falls and Debris Falls - Rock falls occur when a piece of rock on a steep slope becomes dislodged and falls down the slope. Debris falls are similar, except they involve a mixture of soil, regolith, and rocks. A rock fall may be a single rock, or a mass of rocks, and the falling rocks can dislodge other rocks as they collide with the cliff. At the base of most cliffs is an accumulation of fallen material termed talus. The slope of the talus is controlled by the angle of repose for the size of the material. Since talus results from the accumulation of large rocks or masses of debris the angle of repose is usually greater than it would be for sand. Rock Slides and Debris Slides - Rock slides and debris slides result when rocks or debris slide down a pre-existing surface, such as a bedding plane or joint surface. Piles of talus are common at the base of a rock slide or debris slide. Sediment flows occur when sufficient force is applied to rocks and regolith that they begin to flow down slope. A sediment flow is a mixture of rock, regolith with some water. They can be broken into two types depending on the amount of water present. Slurry Flows- are sediment flows that contain between about 20 and 40% water. As the water content increases above about 40% slurry flows grade into streams. Granular Flows - are sediment flows that contain between 20 and 0% water. Note that granular flows are possible with little or no water. Fluid-like behavior is given these flows by mixing with air. Each of these classes of sediment flows can be further subdivided on the basis of the velocity at which flowage occurs. Solifluction - flowage at rates measured on the order of centimeters per year of regolith containing water. Solifluction produces distinctive lobes on hill slopes (see figure 16.2d) in your text). These occur in areas where the soil remains frozen and is then is thawed for a short time to become saturated with water . Debris Flows- these occur at higher velocities than solifluction, and often result from heavy rains causing saturation of the soil and regolith with water. They sometimes start with slumps and then flow down hill forming lobes with an irregular surface consisting of ridges and furrows. Mudflows- a highly fluid, high velocity mixture of sediment and water that has a consistency of wet concrete. These usually result from heavy rains in areas where there is an abundance of unconsolidated sediment that can be picked up by streams. Thus, after a heavy rain streams can turn into mudflows as they pick up more and more loose sediment. Mudflows can travel for long distances over gently sloping stream beds. Because of their high velocity and long distance of travel they are potentially very dangerous. Mudflows on volcanoes are called lahars. Creep- the very slow, usually continuous movement of regolith down slope. Creep occurs on almost all slopes, but the rates vary. Evidence for creep is often seen in bent trees, offsets in roads and fences, and inclined utility poles (see figure 16.2c in your text). Grain Flows - usually form in relatively dry material, such as a sand dune, on a steep slope. A small disturbance sends the dry unconsolidated grains moving rapidly down slope. Debris Avalanches - These are very high velocity flows of large volume mixtures of rock and regolith that result from complete collapse of a mountainous slope. They move down slope and then can travel for considerable distances along relatively gentle slopes. They are often triggered by earthquakes and volcanic eruptions. Snow avalanches are similar, but usually involve only snow. Mass movements in cold climates is governed by the fact that water is frozen as ice during long periods of the year. Ice, although it is solid, does have the ability to flow, and freezing and thawing cycles can also contribute to movement. Rock Glaciers - a lobe of ice-cemented rock debris (mostly rocks with ice between the blocks) that slowly moves downhill (see figure 16.2e in your text). Mass movements also occur on slopes in the ocean basins. Most slope failure can occur due to over-accumulation of sediment on slope or in a submarine canyon, or could occur as a result of a shock like an earthquake. 3 types can occur - (1) Submarine slumps – Coherent blocks break and slip, similar to slumps on land. (2) Submarine debris flows – Moving material breaks apart and flows, similar to debris flows on land. (3) Sediment moves as a turbulent cloud, called a turbidity current. (See figure 16.10 in your text). Gigantic submarine slope failures are widespread on the ocean floor, particularly around islands like Hawaii and off the east and gulf coasts of North America. They are much larger than land-based slope failures and are an important process sculpting adjacent land. When they occur, they create catastrophic tsunamis. (See figures 16.11 in your text). A mass movement can occur any time a slope becomes unstable. Sometimes, as in the case of creep or solifluction, the slope is unstable all of the time and the process is continuous. But other times, triggering events can occur that cause a sudden instability to occur. Here we discuss major triggering events, but it should be noted that it if a slope is very close to instability, only a minor event may be necessary to cause a failure and disaster. This may be something as simple as an ant removing the single grain of sand that holds the slope in place. Shocks and vibrations - A sudden shock, such as an earthquake may trigger slope instability. Minor shocks like heavy trucks rambling down the road, trees blowing in the wind, or human made explosions can also trigger mass movement events. Slope Modification - Modification of a slope either by humans or by natural causes can result in changing the slope angle so that it is no longer at the angle of repose. A mass movement can then restore the slope to its angle of repose. Changes in Hydrologic Characteristics - heavy rains can saturate regolith reducing grain to grain contact and reducing the angle of repose, thus triggering a mass movement. Heavy rains can also saturate rock and increase its weight. Changes in the groundwater system can increase or decrease fluid pressure in rock and also trigger mass movements. Changes in slope strength - Weathering creates weaker material, and thus leads to slope failure. Vegetation holds soil in place and slows the influx of water. Trees put down roots that hold the ground together and strengthen the slope. Removal of tress and vegetation either by humans or by a forest fire, often results in slope failures in the next rainy season. Volcanic Eruptions - produce shocks like explosions and earthquakes. They can also cause snow to melt or discharges from crater lakes, rapidly releasing large amounts of water that can be mixed with regolith to reduce grain to grain contact and result in debris flows, mudflows, and landslides. As we have seen mass movements can be extremely hazardous and result in extensive loss of life and property. But, in most cases, areas that are prone to such hazards can be recognized with some geologic knowledge, slopes can be stabilized or avoided, and warning systems can be put in place that can reduce vulnerability. Because there is usually evidence in the form of distinctive deposits and geologic structures left by recent mass movements, it is possible to construct maps of all areas prone to possible landslide hazards (see the National Landslide hazards map at http://landslides.usgs.gov/hazards/nationalmap/). Detailed local maps can usually be obtained from individual state agencies. Planners can use such hazards maps to make decisions about land use policies in such areas or, as will be discussed below, steps can be taken to stabilize slopes to attempt to prevent a disaster or minimize its effects. Short-term prediction of mass-wasting events is somewhat more problematical. For earthquake triggered events, the same problems that are inherent in earthquake prediction are present. Slope destabilization and undercutting triggered events require constant monitoring. Mass movement hazards from volcanic eruptions can be predicted with the same degree of certainty that volcanic eruptions can be predicted, but again, the threat has to be realized and warnings need to be heeded. Hydrologic conditions such as heavy precipitation can be forecast with some certainty, and warnings can be issued to areas that might be susceptible to mass movement processes caused by such conditions. Still, it is difficult of know exactly which hill slope of the millions that exist will be vulnerable to an event triggered by heavy rainfall. Steep slopes can be covered or sprayed with concrete covered or with a wire mesh to prevent rock falls. If the slope is made of highly fractured rock, rock bolts may be emplaced to hold the slope together and prevent failure. Drainage pipes could be inserted into the slope to more easily allow water to get out and avoid increases in fluid pressure, the possibility of liquefaction, or increased weight due to the addition of water. Oversteepened slopes could be graded to reduce the slope to the natural angle of repose. In mountain valleys subject to mudflows, plans could be made to rapidly lower levels of water in human-made reservoirs to catch and trap the mudflows. Trees or other vegetation could be planted on bare slopes to help hold soil. Some slopes, however, cannot be stabilized, or only stabilized at great expense. In these cases, humans should avoid these areas or use them for purposes that will not increase susceptibility of lives or property to mass movement hazards. What is the main force responsible for mass movements? How is this force affected by slope angle? In what ways does water added to a slope affect its stability? What features in rock reduce the stability of slopes? What are the major triggering events for mass movements? Is it possible to determine whether or not a slope has stability problems? If so, what does one look for? What kinds of things can be done to mitigate against mass movement hazards?